Ah, ok I uploaded a screen from a WIP area. That is an end-game area (part of the story we are working on) that will come in a future update. The disenchanter should describe how to use in the lore on the assembly egg. If you have forgotten what it said you can mine the block to pick it up again and read it. But basically: you place items on top of it. 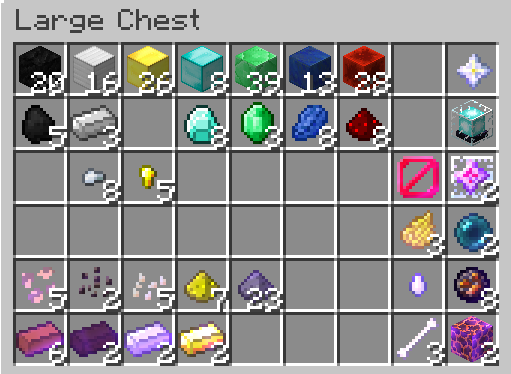 If the item has hidden enchantments (is shiny but has no enchant names) it will scan and reveal them and drop the scanned item below it automatically. This will tell you what is on custom items and some treasure items. If the enchants are already revealed it will take the enchants off items and reset the work penalties so you can enchant and use it on the anvil again and it will convert the enchants into bottled xp energy and drop the disenchanted item below. You can also stand on the disenchanter yourself to convert levels into bottled xp to store xp if you are lvl 10 or above and the bottles will drop below. So leave a space below and above it to use. Those are the 3 uses so far. Good job on bridging I guess lol, but my intention was for players to use the glider when they crafted it. After that you can get around pretty well with the 1.11.2 rockets even before getting the jetpack which is kind of optional now. But sometimes it can take a year or so to get enough for that titanium. I'm assuming that was your problem? You will be happy to know i fixed the bug that was preventing the random meteor showers in this update so meteor metals should be coming in renewably, slowly again. Did you update? If you bridged to the mesa I'm guessing you have enough rare metals to build the glider and other stuff now eh? I have a single suggestion that will save me some hair pulling. 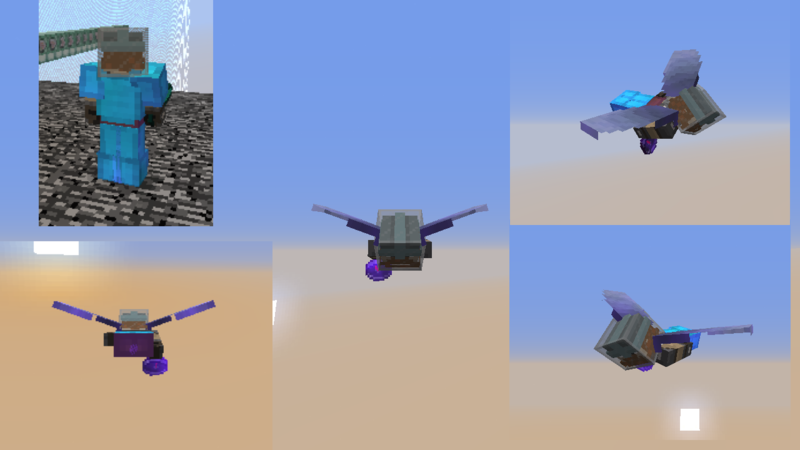 Maybe make the mob books tell what season mobs spawn in? I was really unsure if fish spawned in summer or not. Wow! I'm surprised you got so much done in the first year Gavin. I thought it would take people 2 years to find and explore that many of the custom areas in the local asteroids. I'm hoping we can keep adding new areas each update to give you guys more areas to explore. cool, I'll fix book IX. You are talking about the one in the artifacts chest? 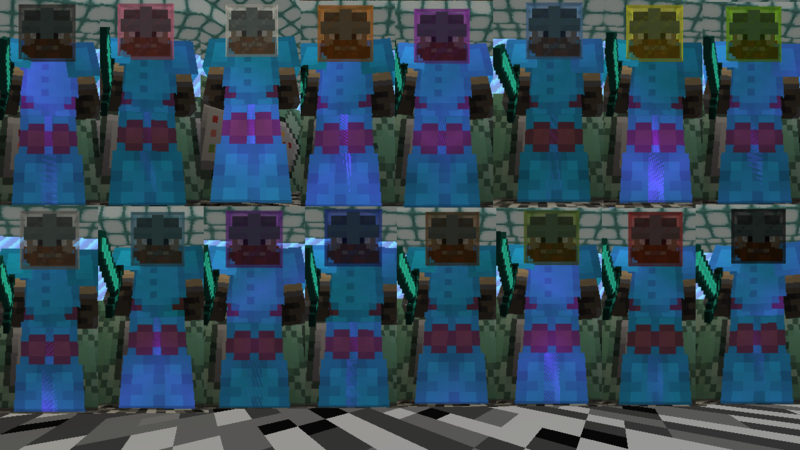 Many of the creatures do have when they spawn in the info books. If they do I put it on the bottom of page 1. I'll try to add the rest of them next update since it sounds like I missed a few. thanks! Also Akitori: if you really hate spring rain it can be disabled with /weather clear X. clearing the weather forces it to stay clear for however long you specify in ticks in X. There are 24000 ticks in a day. But it is mainly atmospheric for spring. I may reduce the frequency of Spring Showers, but probably not more then to about half current as that would also make the rainy halves twice as long as well. It is using toggledownfall so the amount of rain vs. clear weather is equal during spring it just switches randomly. So the bug? they don't drop anything! Like ever! 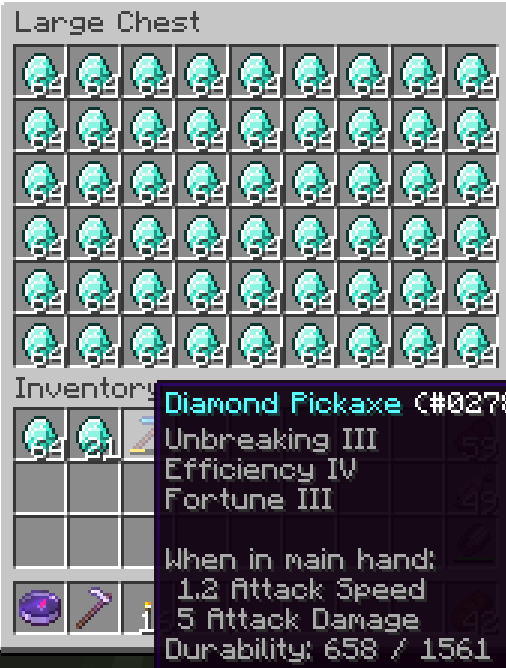 If i get a few drops I'm lucky! Not sure how the item comes into existence, but maybe give it a lot more item health? or something to prevent it from dying from meteor death? It wasn't just in the first year, that was at the end of year 2 and I'm into year 3 now. I could probably manage 100% completion in less than a year if I really tried to, but I prefer to take things slowly and casually. I ended up turning keepinventory on cause I hate losing items on death, and I would suggest adding an option for that. I went into creative to break the class pane above the bed, but that didn't fix the glitchy sleeping problem I'm having, so I don't know whats causing it. I also doubled the number of chests in the ship so I have all my storage in one spot. 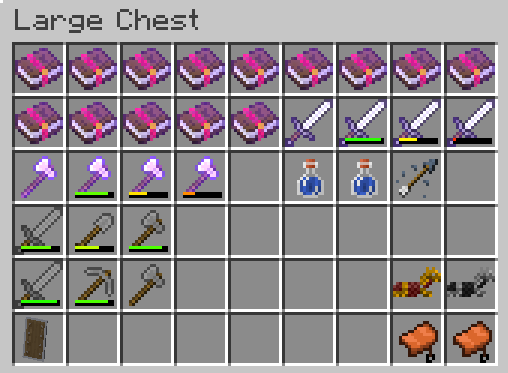 I meant on the lore/tooltip for the mob books, I've never actually checked inside them .-. Huh, I have no trouble at all with just 2GB RAM allocated and a render distance of 20. The only "lag" I usually ever get loading chunks while I'm flying too fast, is just Minecraft's natural tendency to hate loading terrain and I get the same thing in pretty much every map that has so much terrain to load in. If your render distance is extremely high, I would suggest reducing it to see if that helps, since higher render distances tend to slow down the entire thing. Also, allocating too much RAM can cause lag spikes just like allocating too little RAM will lag the game - something to do with garbage collection in Java; so you could also try playing with just 2GB for a while to see if that helps at all. The bottom of the new mesa area had more shiny blue rocks than I did..
wow Gavin! You've done a lot on this map lol! I knew compsogbrickus told me he put a lot of diamonds down there as it was supposed to be a rich area but I didn't know it was THAT many xD. How did you mine them? Were you bridging underneath? Also Gavin, I don't know how long you played without keepInventory but I added a custom death system on this map. It is very unlikely you will ever lose your items due to death. When you die the items are marked with a name-tag, piled neatly for you, and given invulnerability to explosions fire or lava, and if you die in midair the pile even floats so that your stuff won't fall into the void. The only way you can lose items on this map is if you die in the void or if you take more then 10 minutes to get back. (I doubled the time you have too) You should at least try playing with it this way as it has the advantage of giving a penalty for death and not being abusable by dying to get back to the ship. The terrain in the map has a lot of void and fills most of the height limit so there is a bit more to load but yeah, I also use 2GB on a laptop and haven't seen problems. I know that a 32 render always seems to make terrain load slower for me. I personally play at 16. You might mess with that or some render settings? The one thing about this map that isn't on a lot of others is there is a lot of void but most computers don't have a hard time rendering void. Only a few do. I can't remember the brand but there is one processor that has a known issue rendering void. Just in case your issue occurs in specific areas, it is possible you have some old entities that have built up or not properly despawned. I've fixed this issue in the latest patch but you still may need to fly around in peaceful to despawn them if that was the source of your lag. If that is the problem it would lag probably whenever you were in a certain area. Hey akitori! Yes! Meteors CAN drop meteor metals but they are rare. That is probably why you haven't seen them. Most single meteors won't produce it but a shower almost always has a few shards or dust left in craters. That is the best time to go looking. It is not possible for the meteor impact to actually kill the metal it drops because it happens after the strike and the summoned items are invulnerable to damage. I also started work on the new update today! Wanted your thoughts on what you would like to see soonest! We will release new updates every 2 weeks, so the next one is April 1. I can't really promise quicker because it is quite a bit of work to make enough new content to justify a new update and I want to keep each one exciting and unique. - Give some creatures new abilities & add a few more creatures to the seasonal and biome-specific spawning. I was thinking to give some of the new ones some unique sounds and also add at least one more subterranean mob for each season to make caving a little more interesting. And here is a minor thing I wanted some feedback on. I had the idea this week that even without a dedicated texture pack for the map I can still make space helmets! Tell me if you like the look of any of these! My favorites are white, light gray, and cyan. What do you guys think, would this be a nice addition for next update? And would you want me to pick one color or leave it up to players to customize and choose the color of their helmet if I do add it? I just bridged around underneath the mesa area, and I was using fortune 3 so there's probably only about 1000 ore down there (still sounds like a lot tho :P); I have glider now, but it's too dangerous that close to the void. I know there's the custom death system, but my problem was dying in front of bosses and they would keep killing me. Here's Episode 3 of my let's play! Sorry, Dan! As soon as my life slows down a bit, I hope to start a playthrough. 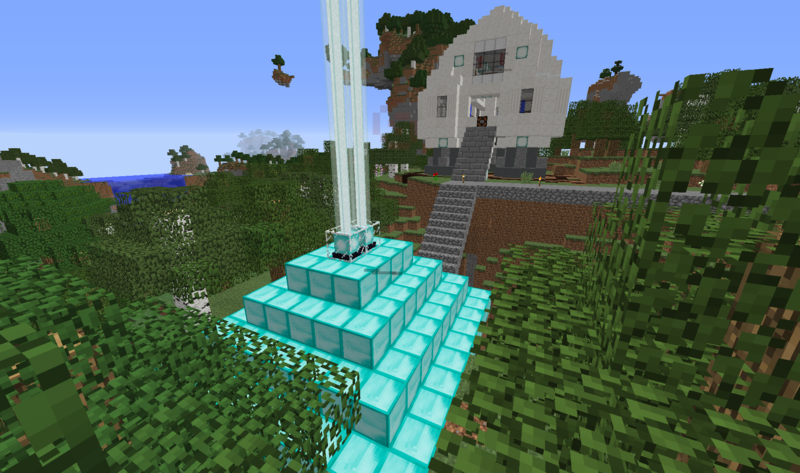 I'm the sort of person who is bored with vanilla survival, but this really makes it interesting, so I hope to start soon. no problem rabid, I understand bein busy. So no comments on adding customization to the space-suit colors and glass helmets? I figured that would be something you would care about, especially multiplayer and youtubers as you could personalize. I am thinking now to allow 8 of the glass helmet colors as personalization options and also 8 similar suit colors. Many of the helmet colors are just different shades of the same thing anyway. I want to narrow it down to 8 (half of them) and they should preferably be colors that can easily complement each other for theming with the suit colors. This will allow for 64 combinations. Also considering having shoe color be something you can vary independent of the rest of the suit as that wouldn't be too much more work. Heya Dan. Just wanted to put something here for your users who connect to a vanilla space expedition server using forge, a minor mod came out that fixes how forge displays the armor! Its made by my friend, the oldone822, who you've seen in my video! I actually have another mod to fix the armor calculation if using forge server or forge single player too. Awesome guys! This is great news for people that like to use forge with cosmetic mods. I've linked your mod in the main post under the recommended settings section. Thank you! Do either of you have an opinion on the idea to add customizable colored glass helmets and biosuit colors to the map in the next update? Lezandria is experimenting with the system now, I finished it last night thinking it may be included in the April 1 update after I get a bit more done. Message me if you want to get a private early release for this as I know it does look a lot better on YT videos. I wonder how the glass/armor color will be changed? will you use some sort of Armor Color or Helmet color scoreboard? I'm all for it though.